You are most likely already planning your holiday menu – I know I have been thinking about for at least week. It’s no secret that I am a “foodie!” After all I do have a food/health blog. Just because I transitioned to a whole food plant based lifestyle doesn’t mean I have given up my desire to eat delicious food. On the contrary, I enjoy food so much more since it is based on fresh flavorful produce, herbs, whole grains and legumes. The trick is to be able to combine them in the most artful way to enjoy their full potential. My dear friend Chef AJ has a knack for creating insanely delicious food that just happens to also be healthy. That is a win – win for the rest of us! No matter what kind of food plan you follow her new recipes are going to impress even the most ardent critic at your holiday table. Chef AJ gave me a preview of her new recipes that will debut in her upcoming Holiday Feast Menu webinar. I couldn’t wait to start cooking and give some of them a test run. One of the things I love about her recipes is that she creates them using ordinary ingredients that many of us will already have on hand. Out of the nine recipes she sent me (there will be 12 recipes in the webinar) I had the ingredients on hand to make all of them – no special trip to the store. The way she takes these everyday ingredients and combines them with spices and herbs results in extraordinary flavor. Chef AJ is one of the busiest people I know, so she has fine tuned her recipes so they are quick and easy without sacrificing taste. In just one hour I was able to make these three recipes. In my opinion they make a complete meal! 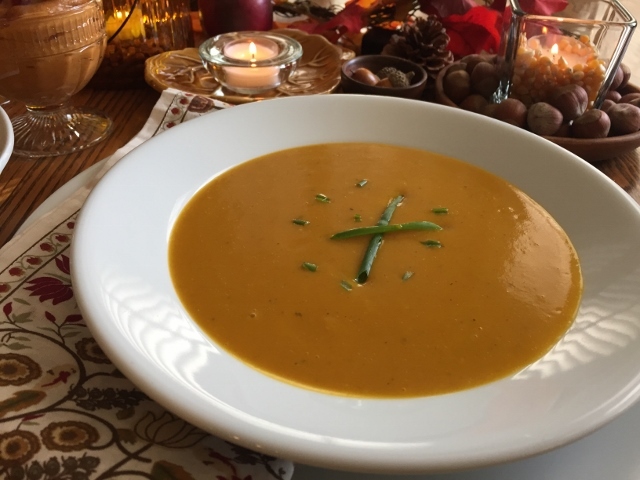 Kabocha is one of my favorite winter squash so I was anxious to make the Kabocha Squash Soup. It was so quick and easy in my electric pressure cooker. It’s a smooth creamy soup with a light curry flavor and just a little smokiness. It’s my new favorite soup! I can see serving this piping hot in mugs and letting everyone sip on it as you put the final touches on your holiday meal. You can make it ahead and keep it hot in the pressure cooker on the warm cycle. Chef AJ also suggests serving it over a bed of black, brown, red or wild rice as a main course. Go out and buy yourself a kabocha squash so you can make this recipe pronto as soon as the webinar airs! I love beets – cooked or shredded raw beets, hot or cold. I love their deep earthy flavor. 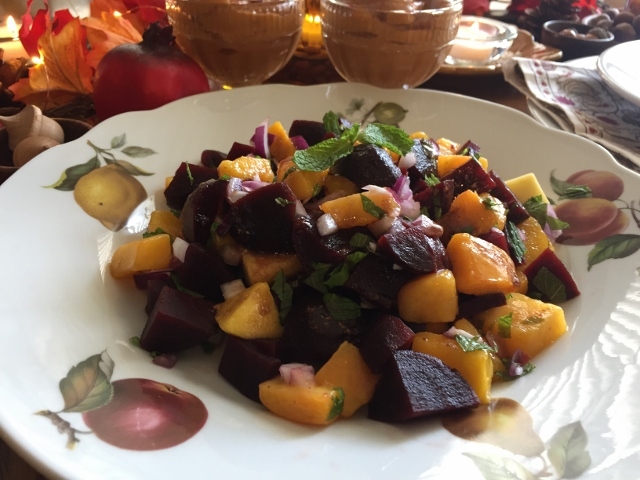 I would never have thought to mix cooked beets with chunks of mango, but it works like magic. It all gets tossed with Chef AJ’s new House dressing and its a party for your mouth. Enjoy every delightful bite as a side dish or serve it over a bed of baby greens for a lively salad. I’m thinking that it would also be fun to serve it over some cold rice or quinoa for lunch. M-m-m-m good! Most of us feel like no holiday meal is complete until you have dessert. These Butterscoth Parfaits can be whipped up easily – in fact you can make it a day ahead of time and that is one less thing to worry about when you are trying to prep the day of your holiday celebration. There is also the option of making it into a pie with a delicious oat crust. Pumpkin pie spice makes this taste like a decadent holiday dessert that everyone in your family will love. They don’t need to know that it is actually healthy and plant based. Go ahead and make a double batch because people are going to come back for seconds! 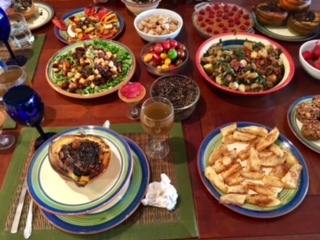 Chef AJ shared the photo above of her complete Holiday Feast Menu. The webinar includes twelve recipes that she hasn’t shared before. A few of them were created by Gustavo who orchestrates Chef AJ’s webinars as well as Dr McDougall’s Thursday webinars. Gustavo himself is an accomplished cook. All of the recipes are compliant with the Ultimate Weight Loss program as well as Dr McDougall’s Starch Solution program. The recipes are whole food plant based, as well as being free of sugar, oil, salt, gluten, flour, soy, nuts and alcohol. They are suitable for just about anyone’s food plan. The most important thing is that they taste incredible! This webinar takes healthy holiday food to a whole new level. Webinar Giveway Time! Note This Giveaway is now closed! The winner was Ricky Shields! Chef AJ is graciously giving one of my readers the Holiday Feast Webinar for free! All you have to do to enter the giveaway is leave me a comment telling me what your favorite whole food plant based dish is for the holidays. Give me a link to the recipe if there is one or tell me what cookbook it comes from. You have until midnight Pacific time – Sunday November 13, 2016 to enter. I will randomly choose one person using Random.org and the winner will be notified by email on Monday November 14, 2016. If you can’t watch the webinar when it airs on Tuesday November 15th, 2016 at 5:00 pm Pacific time, you will be able to watch the replay at your convenience. If you don’t win you will surely want to sign up for this special webinar – I think it’s really Chef AJ’s best one yet and I have purchased all of her cooking webinars. We enjoy her recipes and have them on a regular rotation around here. 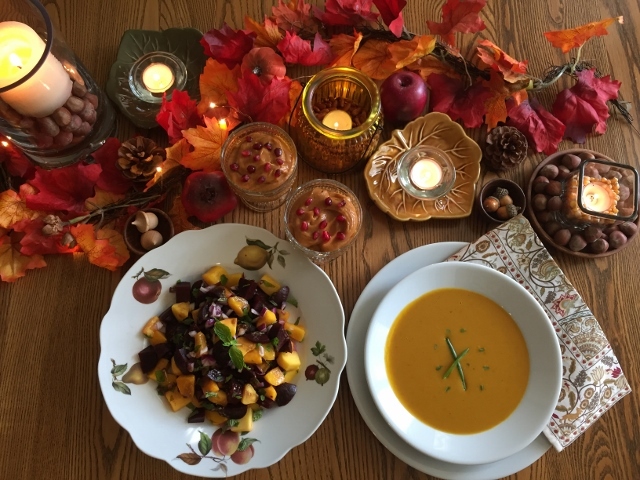 Use this link to sign up for The Holiday Feast Menu Webinar. Even if your family isn’t plant based they would still enjoy any or all of these amazing dishes – it’s all delicious food! Be sure to leave me a comment and feel free to post about this giveaway on your favorite social media sites! Previous Post: « How To Handle The Holiday Binge Season! My ‘go to’ holiday recipes are from The Chef and the Dietitian show #50, https://www.youtube.com/watch?v=GHqKMY8mf4k You just cannot go wrong with anything ‘Chef AJ’. Thank you Tami for sharing about Chef AJ’s Holiday Feast. I am so glad to have discovered this site. It is so nice to have places to go that understand about healthy food and lifestyle. I really like below recipe from Vegan richa website, Broccoli masala pie. Ooh, I’m excited about Chef AJ’s Holiday Webinar! One of my favorite holiday recipes is the Lentil Mushroom Walnut Balls from Oh She Glows. I haven’t yet tried to make them totally UWL compliant, but my bet is it would work fine. I like Southern Cavier from the Happy Herbivore Holidays & Gatherings cookbook. My favorite meal for the holidays is “Pineapple Sweet Potato Casserole” from Sugar and Flours by Joan Ifland. I would love to win this webinar. The food looks a-ma-zing and I could definitely use more compliant holiday recipes. For now I just eat this casserole while everyone else eats all the rest of the food I make. Thanks for the giveaway! Baked Japanese sweet potatoes. I just discovered them and they taste like they are already candied! I wouldn’t do a thing to them. We love Baked Sweet Potatoes with Apples and Cranberries, a Fuhrman recipe. It can be found on his website drfuhrman.com. Chef AJ’s Quinoa Salad with Currants and Pistachios is my favorite for the holidays. It looks very festive if you use the pomegranate arils. Beautiful and delicious! I don’t know what my favorite wfpb holiday dish is as this will be my first holiday eating 100% wfpb! 🙂 I’m still trying to decide what to make. Maybe a stuffed acorn squash. Scouring the internet for ideas. Will have to check out chef AJ’s webinar! I am new the the Whole Food Plant Based Diet. I have not made the Stuffed Pumpkin yet but I will be for Thanksgiving! I like Lynn’s Loaf from the Engine 2 Cookbook. Very simple and always a hit. Shared on both my FB pages. You don’t have a tweet button…. I saw you on the holiday survival webinar, you are very inspirational! I’d love to win the holiday recipe webinar! I like Chef Aj’s Roasted Brussels Sprouts. This is my first thanksgiving since switching to a pbwf diet. I was really looking forward to cooking new recipes and then had a water disaster so my kitchen will be torn up. I still like to dream. I love Happy Herbivore’s crustless pumpkin pie from her Holidays and Gatherings cookbook. Thanks for the chance! I love cauliflower puree made in my instant pot. It serves as a “base'” on my plate for all my bean and vegetable dishes. It’s simple, easy and delicious. Thanks for the preview. For me, a favorite seasonal recipe is applesauce made from fresh local apples. No recipe needed, I just bake apples and them mash them with a little cinnamon or apple pie spice mix. Tami, thanks for this preview! I agree, many of Chef AJ’s recipes are in regular rotation around here and they are equally beloved by my non-WFPB relatives, with whom I’ll share Thanksgiving dinner. My favorite recipe to bring is buffalo cauliflower hot wings. I got the recipe from a Lindsay Nixon newsletter and it is also in her Holiday Gatherings book, which I do not have. There is a similar recipe in the Prevent and Reverse Heart Disease cookbook by Ann and Jane Esselstyn, pg. 234-35. I have made some modifications to increase the health value, such as adding turmeric powder to the chickpea flour batter. Have a great holiday! Your table is very festive. You are great at decorating the dining area to reflect the season. Always on the lookout for new stuffing recipes. This year we’re going gluten-free and nightshade-free so it’l going to be a struggle finding compatible recipes. If not, I guess I’ll be modifying some old ones for myself and make mashed white (for hubby) and sweet potatoes (for me) and Mary McDougall’s FF Golden gravy as the main course with lots of veggie side dishes. 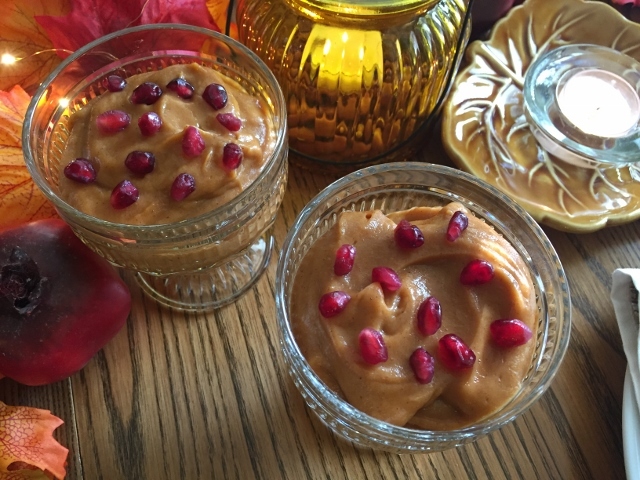 the fall pumpkin mousse, I can have dessert while others do too and love it.